Western scholars have woven intricate categories for Pende masks from the Democratic Republic of the Congo on the basis of their materials, style, and shape. However, Pende themselves categorize masks primarily by the aesthetic emotions that they arouse, e.g. joy, fear, laughing out loud. 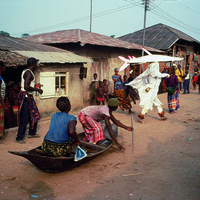 What would happen if we were open to a more Africa-centric mode of understanding masquerade? Professor Zoë Strother, Riggio Professor of African Art, Department of Art History and Archaeology, Columbia University, is a specialist in Central and West African art history, with a special focus on the 20th-21st centuries. She has conducted research in the Democratic Republic of the Congo, Nigeria, Ethiopia, Mali, and Senegal. Her broad intellectual project is to understand the relationship between the image and the social imaginary and its changing history.